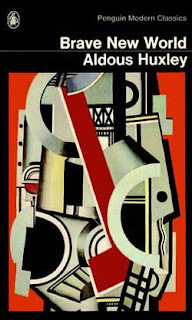 Retro Review: Aldous Huxley's "Brave New World"
Home » books » ebooks » retro review » Retro Review: Aldous Huxley's "Brave New World"
You may have noticed that I usually preface my review with a little 'how I came across the book' anecdote. This book was recommended to me during a particularly enjoyable house party we threw for a dear friend's birthday. As is customary for me when drunk, I was passionately engaged in conversation about literature with one Brian Helmers, and (if memory serves me correctly), it was while talking about Orwell that he suggested I should try Brave New World. Finally, after a couple of years, I got around to reading this book, and I'm really glad I did. Brave New World imagines a future (AD 2540) world in which humans are created in test tubes, different classes of people are bred for different industries, any unhappiness is countered with regular doses of soma, and sexual encounters are encouraged as a leisure activity with no emotional attachment. Despite the apparent perfection of this world, Bernard Marx cannot help but feel dissatisfied, and confined. It is only when he persuades the young woman Lenina to take a trip with him to the Savage Reservation, and they meet John, a young man born of civilized parentage, that things begin to shift. This novel really is remarkable. It seems like such an advanced imaginative view of the modern world, that I can barely believe it was written as early as 1931. There are ways in which it is clearly influenced by its time. For instance, the names of the characters- Marx, Engels, Trotsky- illustrate a cultural fear of communism and the loss of individual identity. The founder of this new state is Ford, and it is clear that Huxley was also articulating a fear of Americanization. What I found so astonishing was the well constructed ideas on creating life in test tubes. The opening of the novel sees a group of young students on a tour of the science facility where multiple embryos are created under different conditions. I could have been reading something from today, it sounded so believable and scientific. The writing itself is filled with some wonderful descriptions that make it a joy to read. I loved the collision of the "savage" and "civilized" worlds when Bernard and Lenina encounter John and Linda. Indeed, John has to be my favourite character because of his determination to suffer. Brought up as an outcast in an Indian community, and exposed to the Complete Works of Shakespeare, he has an appreciation for art, beauty, love, and passion, that those from the new society simply cannot understand. Huxley challenges us to consider what our individuality is worth. While the idea of the soma-induced holidays with no hangover sounds pretty amazing, being conditioned to accept death, to be satisfied with sexual games and no meaningful connection (no emotions at all! ), is incomprehensible to me. I enjoyed this book so much because it made me appreciate pain and suffering as a consequence of relationships. This is beautifully written, completely immersive dystopian novel, and well worth a read.